I’m working on a backlog of posts, but this one had to get prioritized because everyone keeps asking for my recipe. 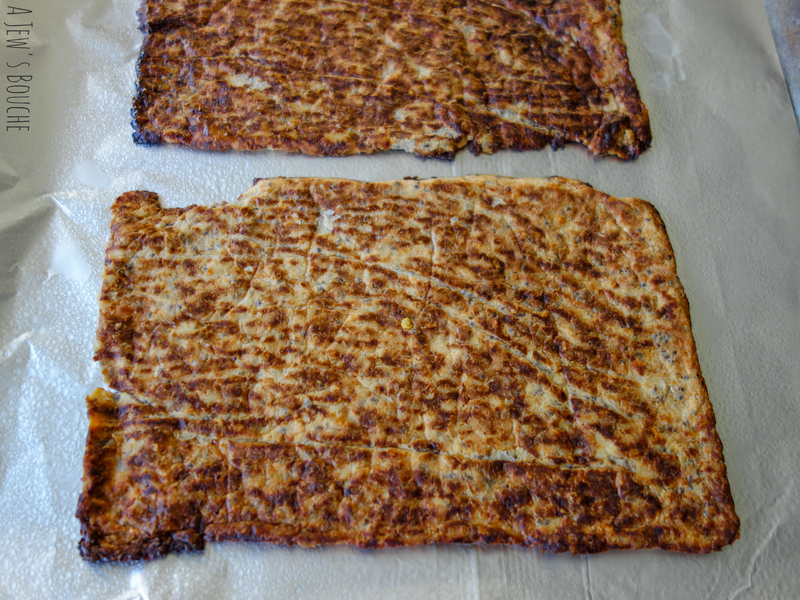 Seeing as this is a perfect Passover, gluten-free, non-gebrokts (moistened matzah) recipe, its time has definitely come! I love cauliflower for its versatility. Turning it into a pizza crust is an amazing application that has been part of my repertoire for a few years (you’ll always find some unadorned crusts in my freezer ready for topping and baking as a quick weeknight dinner). Hordes of people have hopped on the bandwagon, too, most notably since Trader Joe’s started selling riced cauliflower. I make mine from scratch, but I can definitely see how pre-riced would be more convenient. 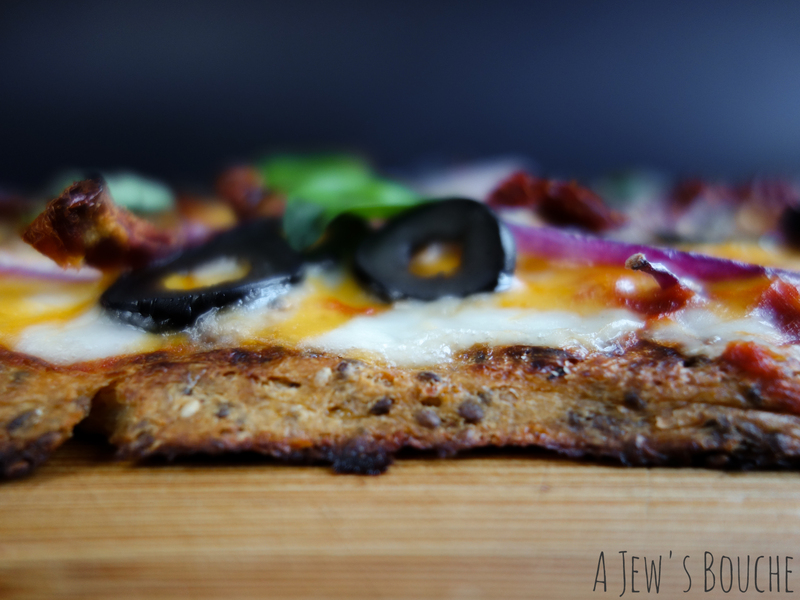 The crust makes a great base for whatever you like on your pizza (sometimes I even over-bake it into a crispy flatbread, great with cream cheese). My version uses a combination of egg, cheese, and optional Greek yogurt to aid in binding. 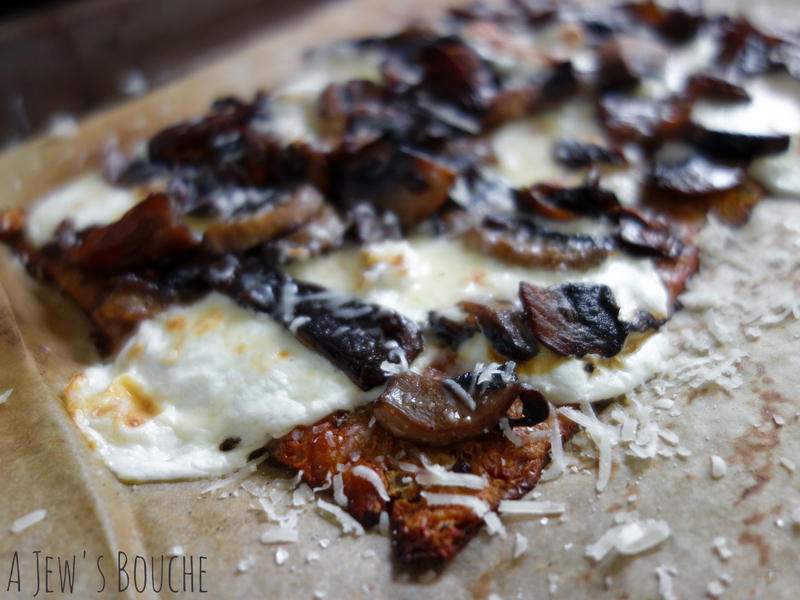 I’ve been experimenting with cheese-free options so I could use the crust for laḥmʿajin, a delicious meat pizza. So far I haven’t settled on a cheese-free crust recipe I like enough to post, but I’ll keep you updated. The other notable element of my recipe is that I love to load up the crust with seasoning. Exactly what I put in varies with my mood or how I anticipate topping the pizza. Here are a couple of my favorite ideas for toppings. 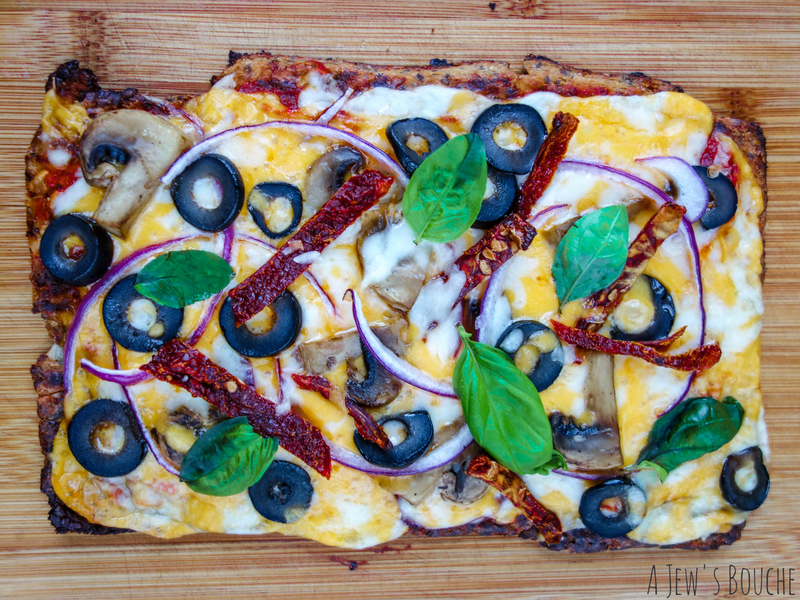 Cauliflower-crust pizza with Sicilian gravy, mozzarella and cheddar cheese, red onion, mushrooms, black olive, sun-dried tomatoes, and fresh basil. 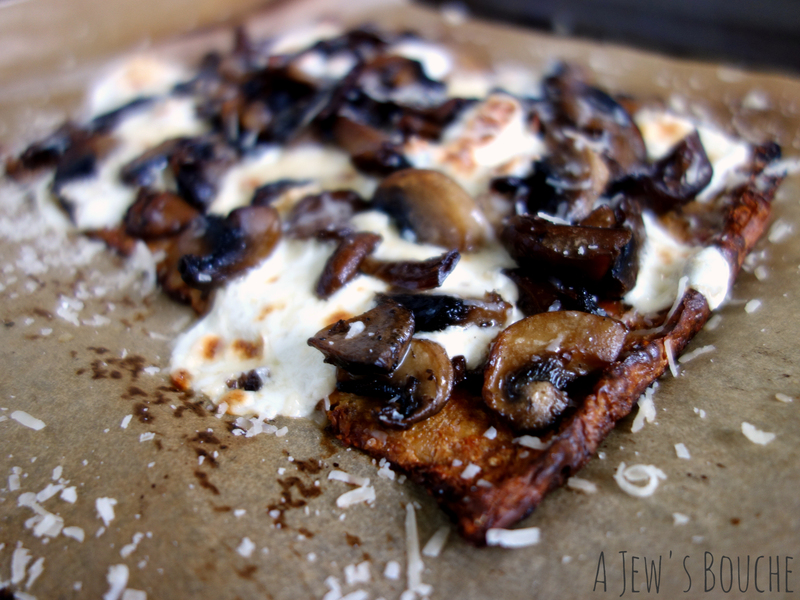 This cauliflower-crust pizza with a blend of wild and domesticated mushrooms, fresh mozzarella, The Cheese Guy‘s 2-year aged Parmesan, truffle oil, and smoked sea salt. The stuff dreams are made of – the ultimate savory, earthy, umami decadence. Start with a head of fresh cauliflower (you can use frozen, too, probably about 1-2 cups), cut it into manageable size pieces and process or grate until grainy and crumbly, like small grains of rice. I used to microwave it for about a minute or two and then squeeze out the moisture (its really important to get out as much excess moisture as you can), but it was such a hassle that nowadays I just skip that step and bake it a little longer, with no detriment to texture or quality. Line a baking pan with parchment paper (or spray lightly with oil) and spread out the cauliflower mixture. Bake it at 350° F for about 45 minutes (it will vary, depending on how much moisture is in the mixture) until it’s crispy. If it’s too moist, you can flip it over and bake for another 5-10 minutes. Then treat it as you would with any pizza crust, add sauce, topping, cheese, whatever, and bake again.